Large breed puppies are the best. Cute faces and clumsy manor aside...it takes quite a bit of food before their body can grow into those floppy ears and big paws. The best way to start them out on a path of quality nutrition is to include real meat and lots 'o carbs in their diet. We've broken down our favorites based on those and other important criteria for feeding your big pup. Let us know what you decide on! There is something uniquely awkward and adorable about a large-breed puppy. While your puppy may start out small, cute, and cuddly, it won’t be long before he turns into a great big adult dog. To make sure that your puppy makes a healthy transition into adulthood, you have to be mindful of what you feed him. While all puppies have the same basic needs, there are a few dietary considerations you need to make for large-breed puppies in particular. Keep reading to learn more about the nutritional needs of large-breed puppies and to receive some feeding tips and brand recommendations. All dogs need a balance of protein, fat, and carbohydrate in their diet to provide energy for bodily functions. Protein is particularly important to grow and maintain healthy tissues and muscles while fats and carbohydrate provide fuel for the metabolism and fiber for healthy digestion. When they are young, puppies look like miniature versions of their adult selves, but they are actually quite different and so are their nutritional needs. While adult dogs need a minimum of 18% crude protein and 5% crude fat in their diet, puppies need 22% protein and 8% fat as minimums. What accounts for these higher needs? The fact that your puppy is constantly growing and he needs protein and energy to sustain that growth. That is why puppy foods are usually higher in protein and fat than adult recipes. While your puppy needs plenty of protein and energy, there is a fine line to walk with large-breed puppies between just enough and too much. What many dog owners do not realize, is that large-breed puppies grow in a different way than small-breed puppies. A 10-pound Bichon Frise may reach its full size around 8 or 10 months of age while a Great Dane puppy might not stop growing until he is two years old, or older! Large-breed puppies grow faster and they stay puppies longer than small-breed puppies. This means that they have some unique nutritional needs. It also means that they have some unique risks as well – if a large-breed puppy grows too quickly it could lead to developmental orthopedic disease (DOD) or musculoskeletal problems as an adult. So how do you make sure that your large-breed puppy gets the nutrients he needs to grow without putting him at risk for growing too quickly? The easiest way is to feed him a large-breed puppy formula. These recipes generally contain high levels of protein to fuel your puppy’s growth and development with a moderate amount of fat for extra energy – small-breed puppy formulas contain higher fat levels since small dogs have faster metabolisms. A large-breed puppy recipe also has more controlled levels of calcium and phosphorus for healthy bones. The ideal calcium-to-phosphorus ratio for large-breed puppies ranges from 1:1 to 1.8:1. That equates to a calcium content of 1.2% to 1.8% and a phosphorus content of 1.0% to 1.6%. Large-breed puppies may also need more glucosamine and chondroitin in their diets to support their developing joints. Even if you feed your puppy a large-breed recipe, you still have to be mindful of how much you are feeding him – excess calories can lead to excessive growth which could put your puppy at risk for musculoskeletal issues as an adult. The best way to make sure that your puppy gets the right amount of food, you should follow the feeding recommendations on the back of the bag. These recommendations are generally made according to weight, so you’ll need to weigh your puppy once a week and adjust his ration as needed. Keep in mind that these feeding recommendations are also generally made on a daily basis so you’ll need to divide it by however many meals you plan to give your puppy each day. As your puppy grows and develops, you want to monitor more than just his weight – you should also keep an eye on his body condition. Up until about 3 months of age, it is normal for puppies to have a bit of a potbelly. Once your puppy fully transitions onto regular dry food, however, that potbelly should start to go away and he should develop a defined waist – an abdominal tuck just in front of his back legs. When you view your puppy from above, his stomach shouldn’t be protruding out to the sides. Another indication of healthy bodyweight is if you can feel your puppy’s ribs through his skin – you should not, however, be able to see them. If you aren’t sure whether you are observing your puppy’s body condition correctly, you can always ask your veterinarian for his opinion. Another important thing you need to keep in mind about feeding your puppy is that you can only keep him on a large-breed puppy diet for so long – eventually you’ll have to switch him to an adult diet. While recommendations vary, the general rule is that you should keep your puppy on his large-breed puppy recipe until he reaches about 80% of his expected adult size. Because large-breed puppies take longer to mature than smaller puppies (because they have a longer way to go), this may not happen until he is 12 to 18 months of age. When you are ready to make the switch, try to choose a comparable large-breed adult recipe and transition your puppy onto the new diet over the course of 5 to 7 days by mixing increasingly larger portions of the new food into your puppy’s old food. As the proud owner of a new puppy, you are right to worry about whether or not your puppy is getting the nutrients he needs. Choosing a high-quality pet food is never easy but it is important that you take the time to make a smart and healthy choice. If you need help getting started, consider one of the top-rated brands below that offer options for large-breed puppies. The Orijen pet food company is known for producing biologically appropriate diets for dogs in all life stages – that means recipes that are designed to mimic the natural evolutionary diet of wild wolves. All of Orijen’s products are made with high meat inclusions and whole-prey ratios which includes fresh meat, cartilage, organ meats, and raw bone for a balanced diet that doesn’t rely too heavily on synthetic supplements. Orijen’s products are made with fresh, high-quality ingredients, many of which are regionally sourced, such as premium proteins, fresh fruits and vegetables, and natural botanicals. When it comes to their dog food products, Orijen offers an assortment of traditional dry foods as well as several freeze-dried recipes and a collection of treats. There are two puppy-specific recipes including one formulated specifically for large-breed puppies. The Orijen Puppy Large Breed Dry Food Recipe features 80% chicken, turkey, eggs and fish with 20% fruits, vegetables and botanicals. It contains a whopping 38% crude protein and 16% fat to ensure that your puppy’s needs for protein and energy are met in the healthiest way possible. Furthermore, this recipe is low-glycemic, limited in calcium and phosphorus, plus supplemented with glucosamine and chondroitin for joint support. With a name like Nature’s Variety, you shouldn’t expect anything but the best from this brand. Nature’s Variety is one of the top brands of premium pet food and they actually offer two product lines. The Prairie line of all-natural diets features quality proteins and whole grains while the Instinct line features a variety of original, grain-free, protein-rich, freeze-dried, and raw foods. All of Nature’s Variety’s recipes are made with high-quality ingredients without the use of artificial additives. If you are looking for a large-breed puppy recipe, look no further than the Nature’s Variety Instinct Raw Boost Large Breed Puppy Chicken Recipe. As part of the Raw Boost line, this product consists of a grain-free and protein-rich kibble infused with freeze-dried raw pieces for a boost of nutrition and flavor. This recipe contains balanced levels of omega fatty acids for healthy skin and coat, plus antioxidants for a strong immune system. You’ll also be glad to know that this recipe contains a balance of calcium and phosphorus for healthy bones and teeth, plus DHA for brain and eye development. This formula features chicken meal as the primary protein with gluten- and grain-free carbohydrates like peas and chickpeas for carbohydrate energy and dietary fiber. This recipe is supplemented with chelated minerals for maximum nutrient absorption and dried fermentation products for probiotic support. The Fromm brand of pet food is a fifth-generation, family-owned operation known for producing artisanal pet food products. Fromm has been an innovator in the premium pet food industry for decades and their products are hard to beat when it comes to quality. Fromm Family Foods offers three different products lines for dogs – Classic, Gold, and Four-Star. The Classic line only includes two recipes – one for adult dogs and one for mature adults. The Four-Star line includes an assortment of recipes designed specifically for a rotational diet. The Gold line includes a dozen holistic dry food recipes for puppies, adults, and senior dogs, including size-specific formula. For large-breed puppies in particular, Fromm offers two options – the Fromm Gold Holistic Large Breed Puppy Recipe and the Fromm Heartland Gold Large Breed Recipe. Both of these recipes are intended for puppies who will grow to more than 50 pounds and they are made with premium proteins like beef, pork, duck and chicken. Both recipes contain 26% protein and 14% fat, plus they are fortified with probiotics for digestive support. 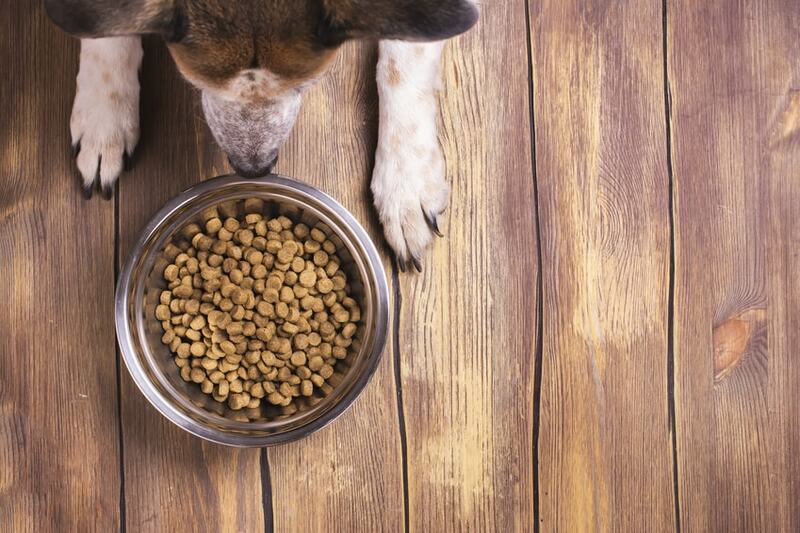 Blue Buffalo has become one of the most recognizable names in the pet food industry. Not only does this company offer a wide variety of different choices, but all of their formulas are made with the highest quality ingredients that nature has to offer. Not to mention their dog food is actually affordable. Blue Buffalo’s dog food products can be divided into four different product lines. The Life Protection Formula line of products includes all-natural recipes made with premium proteins and digestible whole grains. The Basics line features limited ingredient diets made with novel proteins and a select few main ingredients to reduce the risk for food allergies. The Wilderness line includes protein-rich diets designed to mimic the natural evolutionary diet of wild wolves. Finally, the Freedom line features grain-free diets for dogs in all life stages such as the Blue Buffalo Freedom Grain-Free Large Breed Puppy Recipe. This recipe features deboned chicken as the main ingredient with no by-products and no corn, wheat, or soy ingredients. It is rich in protein to support your puppy’s lean muscle growth and is fortified with essential fatty acids for healthy skin and coat as well as brain and eye development. This formula contains a precise blend of calcium and phosphorus, plus it is fortified with LifeSource Bits, a proprietary blend of vitamins, minerals, and antioxidants to ensure complete and balanced nutrition for a long and healthy life. Nutro is the Natural Choice company and it is aptly named because this brand only uses the freshest natural ingredients in each of their products. This brand actually consists of five unique product lines for dog foods as well as a dedicated line of dental treats. When it comes to variety, Nutro offers a large selection of products for dogs in all life stages and all breed sizes. If you are looking for a large-breed puppy recipe, Nutro has several options to choose from including one traditional recipe and one limited ingredient diet. The Nutro Large Breed Puppy Limited Ingredient Diet is an excellent choice because it is made with premium Australian and New Zealand lamb for protein-rich nutrition as well as whole brown rice for digestible carbohydrate and dietary fiber. This formula features both fresh lamb and lamb meal as well as nutrient-rich chicken fat, whole grain oatmeal, and chickpeas, plus an assortment of chelated minerals and other beneficial supplements. To fuel your large-breed puppy’s growth and development, this recipe contains 26% crude protein and 15% fat with just 3% dietary fiber to ensure smooth and regular digestion. This recipe is also loaded with natural flavor your puppy is going to love. Choosing a high-quality diet for your puppy is of the utmost importance, especially if it is a large-breed puppy. While the nutritional needs of large-breed puppies are not drastically different from those of smaller puppies, there are some differences you need to be aware of. The easiest way to make sure that your puppy’s unique nutritional needs are being met is to choose a large-breed puppy recipe and any one of the brands reviewed above would be a great place to start.